I hope you are ready for the trick-or-treaters. We are not so more than likely we will have the lights out and instead watch some scary movies. 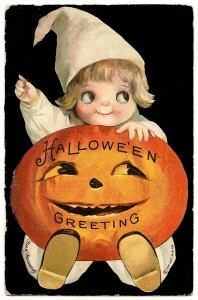 I do love to see little ones in costume and get in the spirit but I think this year I’m going to take it easy. So I wanted to drop in and wrap up my R.I.P. Reading challenge. My goal was two read two books and I did. Yay. The first one was Tricks by Ed Mccain and just last night I finished No One Gets Out Alive by Adam Neville. Still haven’t gotten around to doing quick reviews but both were perfect for the season. Thanks again to the Estella Society and Carl V. for bringing us this great reading challenge. The Monkey’s Paw by W.W. Jacobs. You can read the entire short story here. I love scary books no matter if it’s Halloween or not. 😉 Hope you’ve a wonderful weekend, Iliana! I always love spooky reads, but especially in November when the trees are bare and the skies are grey. Curling up with spooky stuff is so atmospheric in November, and the challenge doesn’t really have to end! We had a lot of trick o treaters come by our house last night. We pretty much ran out of candy. I do wish I had read something spooky this year but that didn’t quite happen. Hopefully, next year I can plan to do the RIP event. A quiet night in with scary movies on Halloween sounds wonderful, Iliana. I hope you had a nice evening. I took my daughter out around our neighborhood and she had a great time. Some of the houses in the area really go all out. I mentioned to my daughter next year we might just go trick-or-treating and not give out candy, and she got upset. She loves to hand out candy too. Hope you had a fun Halloween! I only managed one book for RIP this year and that was a graphic novel but it was a good one!